I can’t imagine owning an original painting from Bob Ross. He brought to life my imagination as a kid with paint,brush,and visionary talent. A tree here. A lake there. Maybe a waterfall? I am interested in purchasing . Any info will be greatly appreciated. I own an original Bob Ross oil painting of a mountain arctic landscape and am looking to sell the work. If you are still interested please feel free to email me at inquire@henningfineart.com or call at 407-739-3068.
my names Will and i am very interested in buying an original bob ross painting but im not trying to spend more than 100$. I know his originals typically go for over 200$+ but if you are willing to sell for a little cheaper i will definitely buy from you… if you want to sell to me just message me here and we can figure out a better way to contact each other. You’re more likely to spend ten times that amount. You’re not going to find anything for less than several thousand dollars. I don’t know where you for the idea that they were going for so little! Best of luck in your search, though. I just spoke with Adam and he was very knowledgeable and helpful! The painting he referenced above is no longer for sale. Adam, do you still have an original Bob Ross for sale? What is your asking price, please? Do you still have the Bob Ross painting? If so, please email pictures to keith (at) haysfamily (dot) org. Do you have a way to authenticate it is an original? If I can ever find one I will take out a hefty loan for it. That is a priceless piece of history for me and would be worth every penny. Value goes up with time so is it really a waste of money? No. 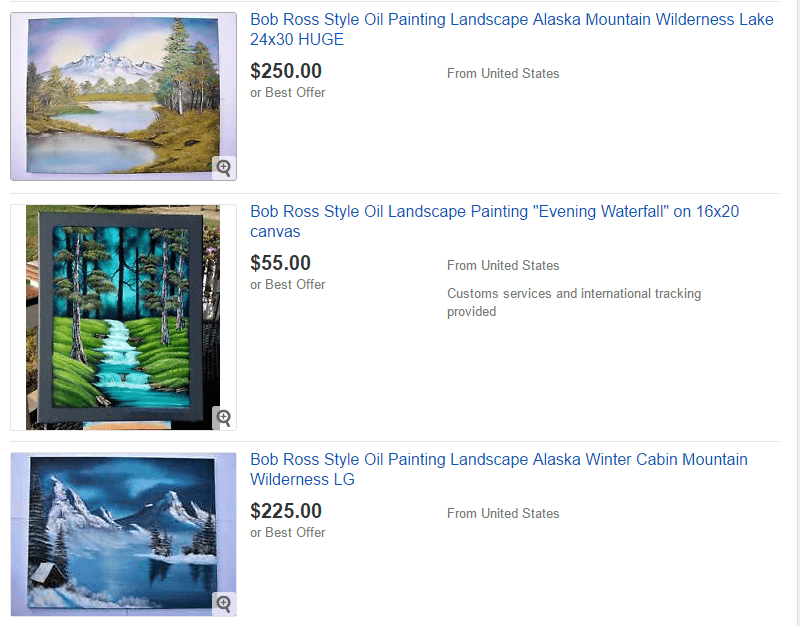 We would strongly advise against buying a Bob Ross painting as an investment. So what happens if someone in Alaska finds a vault in his basement that contains 5000 Bob Ross paintings? Or some Weinstein-like news surface? Your investment is gone. If you’d like to own a painting because you like Bob Ross that is another thing. But we’d still think it wouldn’t be a good idea taking a loan for it. By that logic you should never invest in any artist though I do agree with the quantity issue he did duplicate his paintings three times for the show and his how to books. I wouldn’t worry about the Weinstein scenario too much because by most accounts that hackfraud Picasso was a class A abusive sociopath towards women and his garbage painting still sell for millions. You’ll never here Weinstein-like news surface. He was everything he portrayed on TV in real life. He was that person. We have a Bob Ross painting that we want to sell. My father in law bought many years ago at an art gallery. He had a letter of authenticity and a picture of Bob Ross standing with the painting. Over years of moving, he lost them. After he past away, my husband inherited it and we would like to sell it. I can email you pictures of it and his signature. Do you still have the Bob Ross painting? I would be very interested in your bob Ross painting if still avail. DO you still have this painting? Do you still have some? I would be interested in getting one for my son. My grandsin is learning to lice art and Bob Ross has become his favorite. If you do still gave the painting please let me know as well as what you’d like for it as I know he’d be overjoyed to have one. Sorry to disturb you, but hopeful. Did you sell your painting? I would be interested in talking to you about it. Thanks! I have a wonderful original painting by Bob Ross I am currently selling. Please let me know if you are still interested in acquiring one. I have a original Bob Ross title Night Light that I am selling. For how much? Is there any way to contact you about further details? Hello! I’m interested in hearing about your original Bob Ross. Please let me know how I can get in touch with you! Hello, I am very interested. Please email me with details if it is still available. We own several of Bob’s paintings and his gold pans because my dad was his boss in Alaska. They are very sentimental to our family and we won’t sell them because he was one of my dad’s best friends. I’m sure many people who lived in Alaska and bought his art there feel the same way. Once they pass away, the families will start selling them. Hello Angel! I’m interested in hearing more about the original Bob Ross paintings that you own. Please let me know how I can get in touch with you! I will be willing to pay a premium for this. It’s a gift for my father. I have an original, signed twice. Inscribed and signed on the back also. It’s an Alaskan mountain scene. What premium are you willing to pay? Hello, I would be interested in purchasing your painting signed by bob ross. Hello Charbaby! I’m interested in asking you a few questions regarding your original Bob Ross paintings. Please let me know how I can get in touch with you! Do you still have painting. If so could you shoot me a price. Do you still have your Bob Ross paintings? Hello! I’m also interested in any Bob Ross paintings that might be available for purchase. Have been a huge fan for years. Whom ever you decide to sell Bob’s painting to, please consider allowing those of us who are from the land he loved to retain his gifts to the world. Bob did such an excellent job of conveying the magic, peace and joy of the Alaskan interior to the world, and he holds a special place in our hearts. Those of us from the Kenai Peninsula, the Matanuska Valley, and all the villages along the Parks highway consider his works a part of our heritage. If it is not too late, please consider allowing me to try and obtain matching funds to whatever buyer you’re considering. Mr Ross’ work reminds us of our love for our native lands. Thank you very much for your time and consideration. I am interested in purchasing a Bob Ross original for my daughter’s high school graduation. It blows me away that an 18 year old girl is interested in his show, “The Joy of Painting”, quotes him often and has a Bob Ross original at the top of her wishlist. Then again, I see how calming his show is to her and that makes his paintings an invaluable representation of tranquility in this fast-paced, high-tech, busy world! I’d love a Bob Ross painting. Email me at shailee.sewell (at) gmail (dot) com thanks! What would you like to have for them? I’m really interested in hearing more about your original Bob Ross work. Please let me know how I can get in touch with you. I have a large format Ross original (about 4×7 feet). I was one of Bob’s “drinking buddies” prior to his passing. The last project he started working on was making a large painting on stage in Branson at Hank Snow’s venue. I built a power easel that would let him paint a tree by holding his brush still while he stepped on a foot pedal. At this point in my life I’m ready to part with this huge pix as it is too big for my house. He only completed 12 of these big pix and mine is the only one not in the hands of family or company. Any interest out there? I’m really interested in hearing more about your relationship to Bob Ross. Please let me know how I can get in touch with you! I’d love to hear about how you got this original! Please email me bryunroo@gmail.com! I’m interested in your paintings made by your friend Bob. I grew up watching him on TV and he inspired me to be a painter by trade. How can I get in contact with you sir? That’s amazing! Please contact me at theolemle (at) gmail (dot) com. I am seriously interested in purchasing this piece from you. Thank you! I really want one. One day I will be the proud owner of one of these iconic paintings. Does the price of the paintings fluctuate very much? Hello I paint bob ross paintings if u are interested check my art faceboook gallery DomenisArt. I have painted close to 10 paintings of Bob and will be ready for sale soon and am preparing a few of them for framing and varnishing. Some of them I have given to family members. Sorry I don’t have originals of Bob but they are pretty close lol with practice. Bob’s my idol. We have an Bob Ross painting that my husband inherited. My father in law bought it at an art gallery many years ago. It is approx. 24×48. It I s in a beautiful frame. My father in law had a letter of authenticity and a picture of Bob Ross standing with the painting. Over the years he lost them. I have several pictures of this painting I can email. Hi Mary, are you still selling this painting? Please email me at Toronto.sale@outlook.com – I am very much interested. Thank you! Hello! I’m very interested in seeing the painting and asking about it! Also if anyone else has any other paintings I would love if you got in contact with me! It’s a gift for my husband and he absolutely loves Bob Ross. Thank you ahead of time for anyone who does get in contact! I have an original Bob Ross painting. I would sell it for the right price if any interest. I have one, how do I know it’s legitimate? I inherited it from my late husband’s grandmother. It has his name signed in the bottom left-hand corner and a number written on the back of the canvas. I grew up watching him and am a huge fan. It would mean so much to me! Hello. My name is Bob and I have an original Bob Ross painting for sale. Serious inquiries only. Email me at bobtheboss@mailinator.com Thanks and God bless. Ok Jane. I bid $50,000. We unfortunately purchased a painting from a dealer claiming it was an original. We had it authenticated by The Bob Ross Co. Onlynto find out it was Most definetly Not a BR. We are heart broken and if any of you above still jave a Bobb Ross your selling please let me know as we would definetly be interested. Very interested in a real authentic Bob Ross painting. Will pay cash. My wife is a huge fan of his and I wanna surprise her for our 8 yr anniversary this coming April. Big Fan and I would also like to purchase an original Bob Ross painting. If you have one, please contact me at dmoberly@bellsouth.net, posted 12/16/2018. Have a “Happy Day”, Thanks! Did Bob Ross ever do a commercial were his head was in a cut out of a painting?? If he did I might own it. Any help with authentication of this piece would be appreciated. If anyone is still selling one in 2019, I’m a seriously interested buyer. Please email me at oregonsummers (@) gmail (dot) com. I tried when I was younger to paint with Bob Ross. Never came out even ok. I was always better with a pencil in my hand. I would love to paint even a hair of Bob. Hello Everyone! 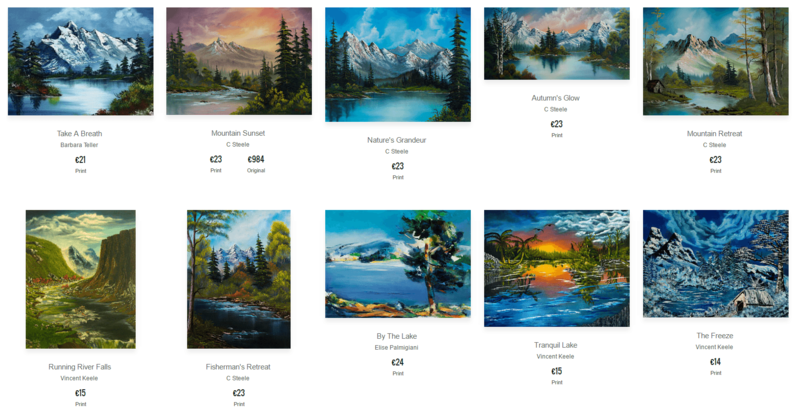 Please to announce I have just acquired and incredibly work(s) by Bob Ross. All are signed and have their appropriate COA’s. Please send me an email if interested, only serious inquirers please.